It's all open-sourced, so check out the "Resources" page for code. Feel free to borrow any ideas for your own build. 3 months of little packages of components arriving from China, and another couple of months procrastinating over different ideas for housing the project - the physical build is far more involved than the electronics, which couldn't be simpler! 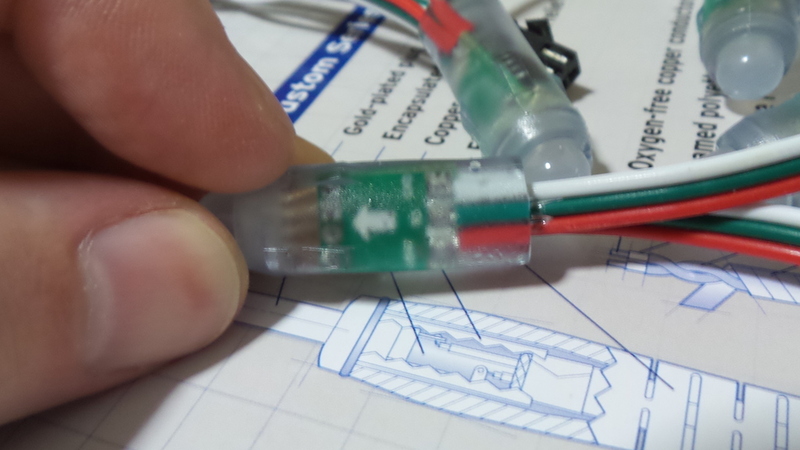 This is where it started - taking delivery of a WS2811-based addressable LED Strip from aliexpress for all of USD$17. The easy part - not many components involved. All driven from a 5V 2.5A power supply. 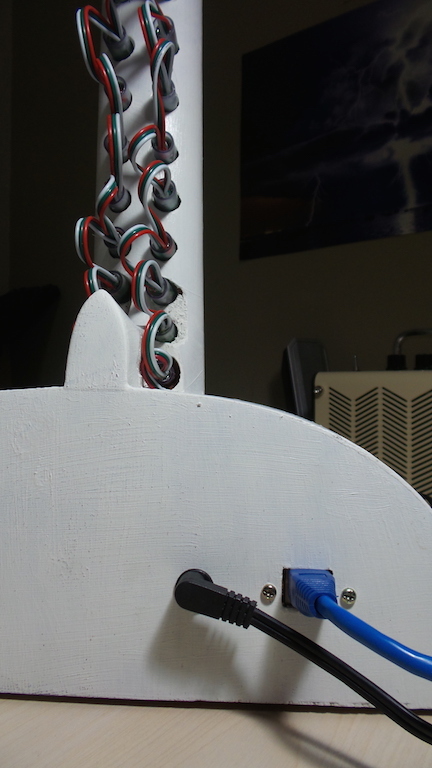 As installed within the guitar body. 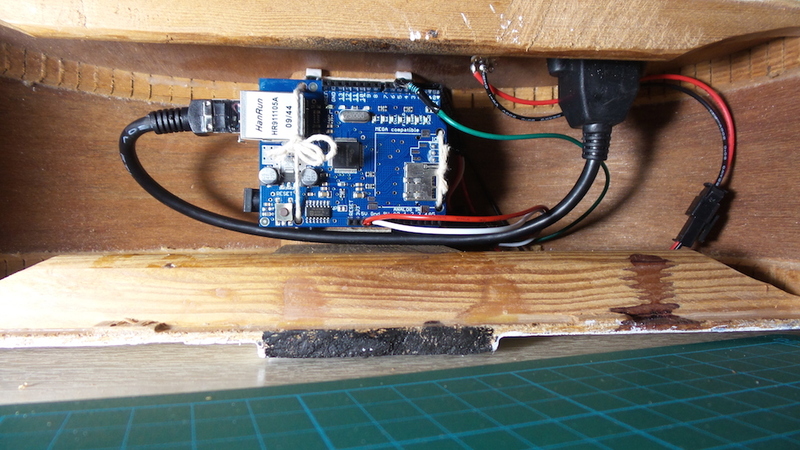 Mounting the Arduino is a bit old school, but works OK. 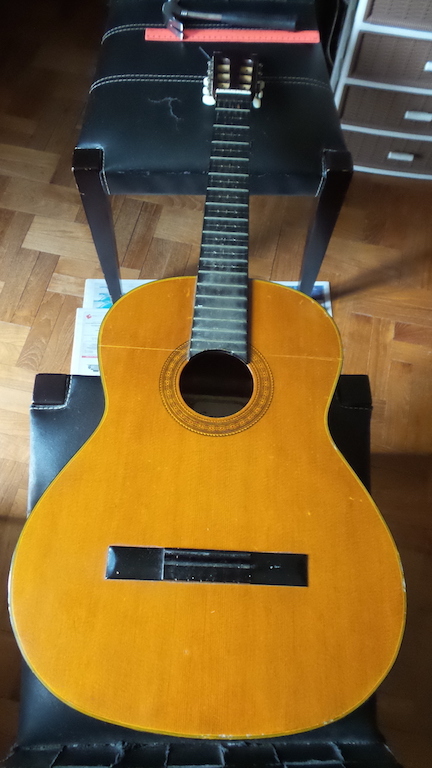 I bought this in Brunswick about 25 years ago, and it's the one guitar to survive all my many moves since, more for sentimental reasons than any sonorous character. Finally, for the chop! For those about to chop, we salute you. Drilling clean holes through the neck turned out to be troublesome. Perhaps my rusty toolsmanship, or just tinder dry wood, but I managed to splinter what should have been smooth bores for the LEDs. 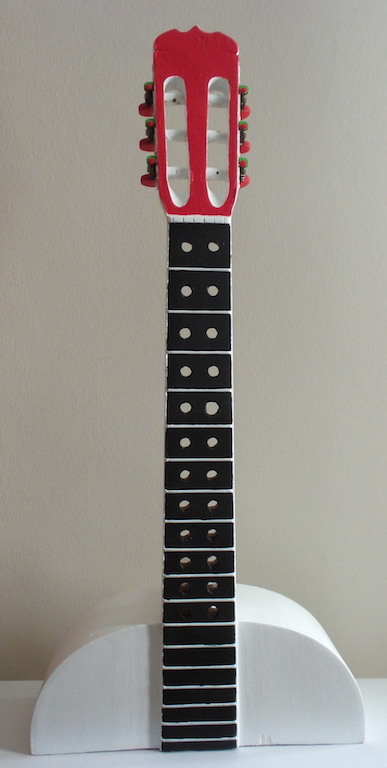 A quick strip back of the grundgy neck and body before painting. 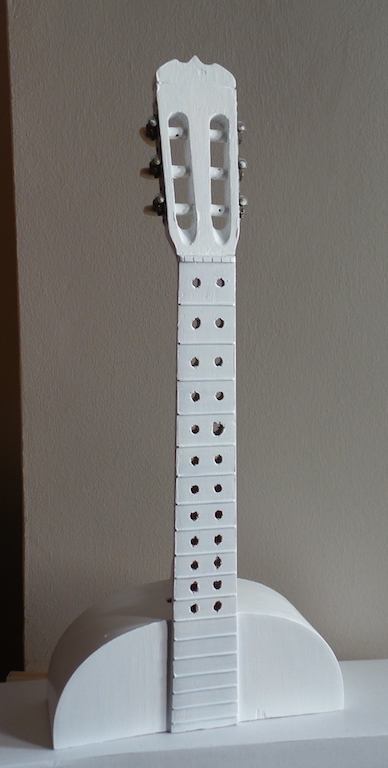 Painting begins with a white undercoat in acrylic. 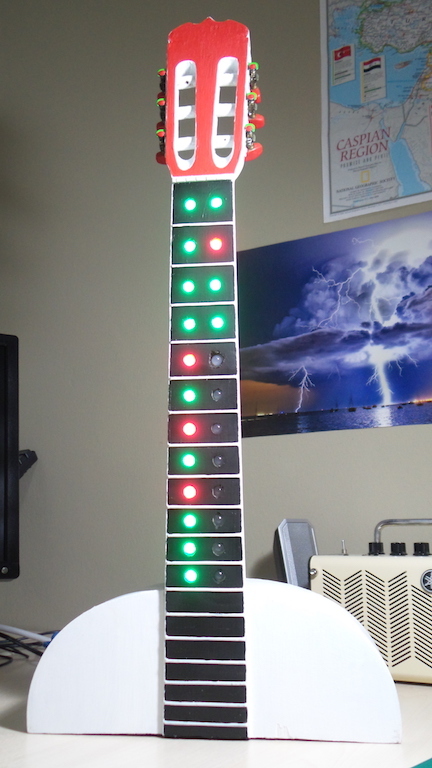 Here you can clearly see one LED holes I fluffed. The somewhat amateurish paint-job complete! It has a gloss varnish finish. 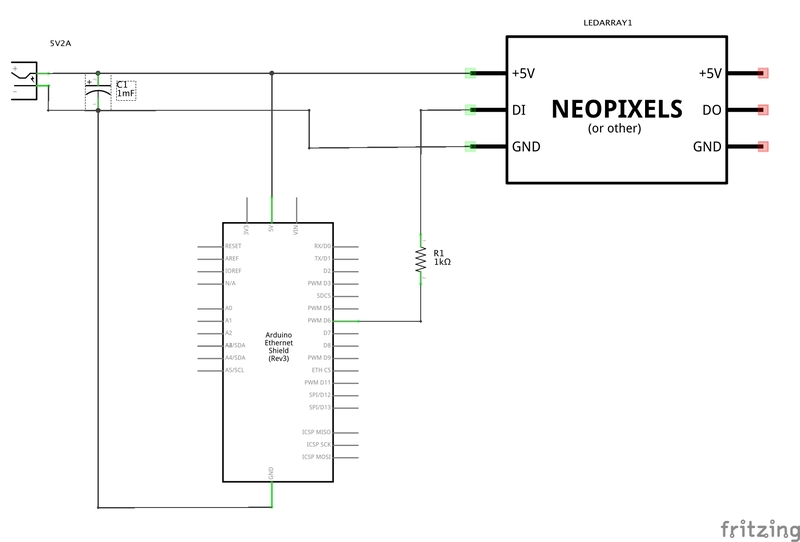 Ethernet and power connectors. 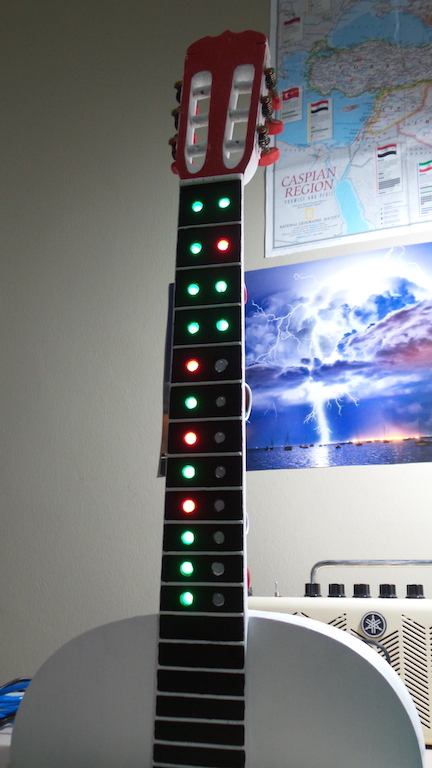 You can also see the LED array strung along the back of the neck - turned out no special tie-down required for the wiring. Bench test, and all's looking good. 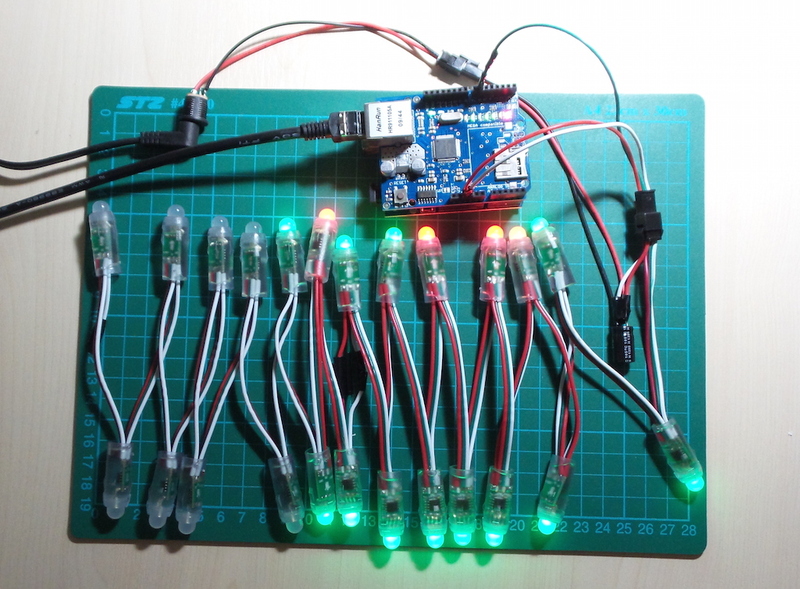 Only 16 LEDs alight, because that's the number of projects I have on CI at the moment - the remaining 8 LEDs will be used as more projects added to the CI server. 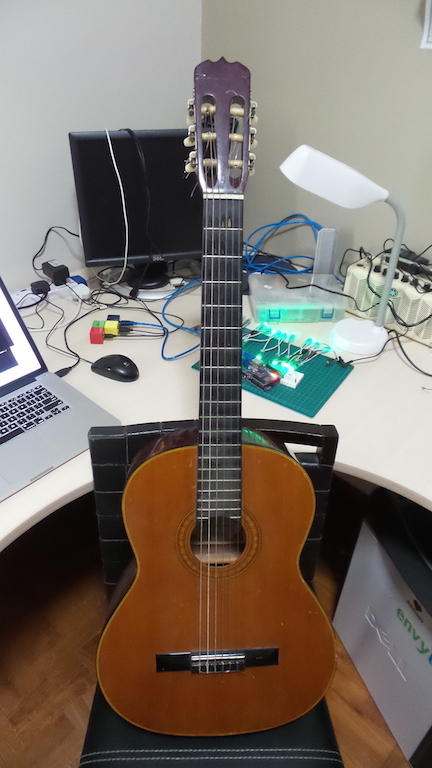 See the FretBoard GitHub repository for the Arduino code and more details of the on-board processing. 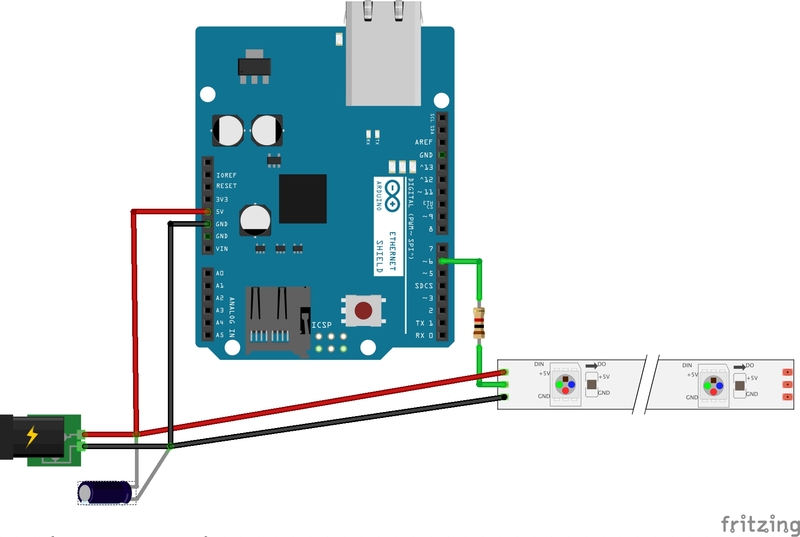 The Arduino has limited memory and networking support, so to simplify process of getting build status, the request is proxied via a site which offers the build status in a simplified CSV format over HTTP. A suitable proxy that can handle the CruiseControl XmlStatusReport format is included in the repository for this web application. 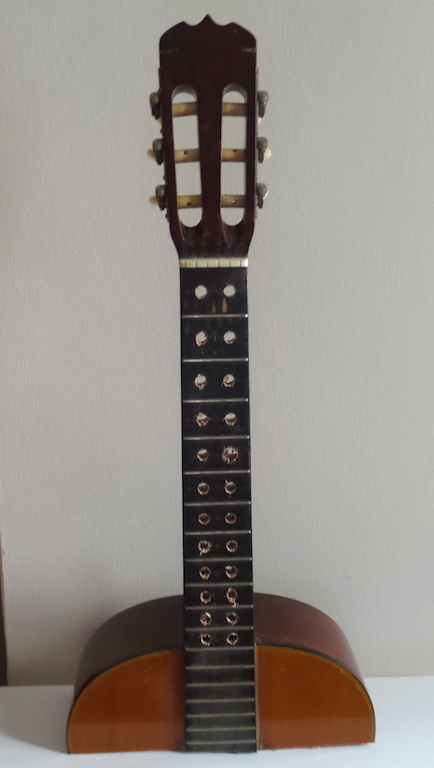 You can support "The Fretboard" by checking out some ads or posting to your social network..